Developing creative thinking, self-expression, and self-esteem are important skills your child can start learning as early as kindergarten. Seven delightful child development workbooks, created by Dr. Linda Silbert, PhD and Dr. Al Silbert, EdD, provide fun learning experiences for your children. 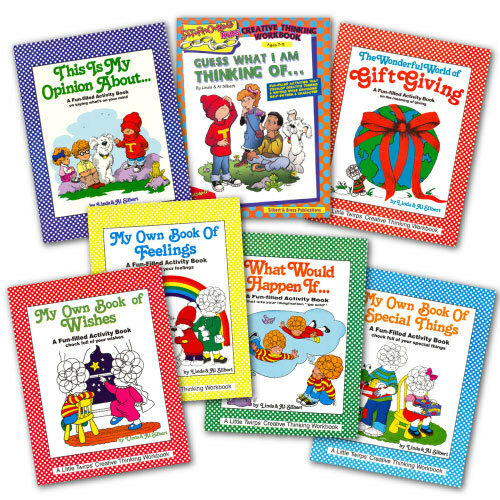 Focused on Creative Thinking, each book also helps children develop self-expression, communication skills, and self-esteem. Written for various age levels, children answer questions, solve problems, or finish intriguing sentences in words and pictures. No wrong answers in these books. Kids are free to express themselves without worrying about making mistakes. Children experience a sense of personal achievement so important in building self-esteem. The Creative Thinking Workbooks give kids lots of opportunities for writing and drawing. Answering the questions helps build their communication skills. Parents and teachers also use these fun resources to encourage self-expression. Kids love these books filled with activities that let them share their opinions without judgment. They can write, draw, and color on every page. The high quality paper used in the books makes them easy use, even to erase. Parents can use the Creative Thinking Workbooks at home. And teachers can use the books with all the kids in their class. Includes parent's and teacher’s guide. The Creative Thinking Workbooks also help children who have learning disabilities such as dyslexia (reading disorder), dysgraphia (writing disorder), ADHD, and Autism. “It is always a pleasure to review and recommend high caliber material to the 22,000 subscribers of DADS ONLY. Your Creative Thinking Workbooks certainly qualify in that category.” --"Dads Only"
From TEACHER'S CHOICE AWARDS in response to, "Would you recommend this product to other teachers? Yes, I would recommend these books. Anytime children are enthusiastic over writing and thinking is a good thing! Yes, I would recommend this product. Good ideas. Yes. I really enjoyed the great use of the workbook space. Yes. This is a great writing tool. I would recommend this book. It is a fantastic outlet for creativity! Pick up Creative Thinking Workbooks Today and Save. Publisher: Silbert & Bress Publications, a Division of Strong Learning, Inc.